Hello Lovelies! I’m so excited this week is finally here! In a few days, I will be making my first ever trip to Vegas!! I’m going for a girlfriend’s bachelorette weekend, so you know it’s going to be fun. If you have any recommendations on things to do during the day, leave them in the comments. Our evenings are planned, but we have some free time during the day. Now let’s talk about this outfit. 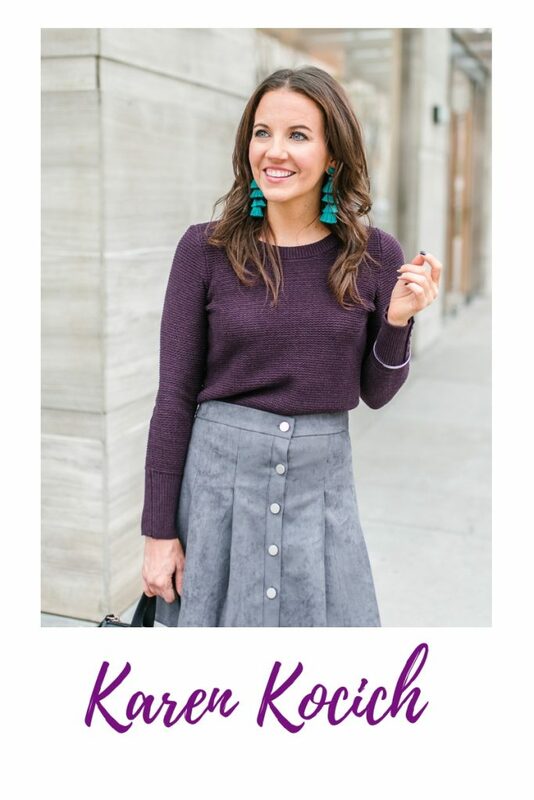 My cold shoulder sweater love continues with this one in the most gorgeous shade of dark purple. The color is so rich giving such a dressed up feel to the whole outfit. I was sold on this sweater as soon as I saw this color. It’s the perfect shade for any and all holiday parties! The weather is finally cooling off, and I may have to break out these black slouchy boots for work this week. The afternoons might be a little too warm, but I can’t wait any longer to wear them. I know they will pair perfectly with skirts and dresses on cooler days. One other way I plan to get lots of use out of these boots is with skinny jeans to all the happy hours and holiday parties. This whole outfit would be perfect for Thanksgiving or Christmas. I can’t wait to see what outfits you have on your blogs this week. 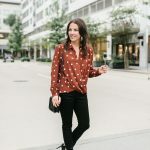 Don’t forget to scroll down to share or just to find more fall and winter outfit ideas. Thanks for stopping by ya’ll! Gorgeous sweater, such a great colour! I love those slouchy boots too. That color is gorgeous on you! I have several cold shoulder tops, and I still feel like I can’t quite pull them off! Tips?! Beautiful sweater on you! Gorgeous! That plum color is so perfect on you. And I’m a sucker for anything cold shoulder! Also, you totally rock those slouchy boots. That color looks amazing on you. I love being able to wear cold shoulders in the fall, gorgeous sweater. The color of you sweater is so beautiful! Love this outfit! love the sweater! So cute with the boots! Those boots are fantastic, and I love how you’ve styled them! Thanks for hosting the linkup, and have fun on your trip! Beautiful look! I love the sweater and boots. My recommendation for Las Vegas during the day is get up early and take a walk on the strip. It’s nice and quiet then, not a lot of people are out, and you can get some great pictures. Next, go to the Flamingo and walk around their beautiful gardens in the quiet of the morning. It’s so lovely. There is also a great mall at the of the strip “The Fashion Mall” I think it’s called. The pools in Vegas are only open during the day, but they are so crowded and the water is not heated, so we didn’t spend much time there. Love this gorgeous sweater, Karen! Hope you have a great time in Las Vegas! What a great sweater, Karen. And have a blast in Vegas!! I love those boots!! Slouchy boots are definitely back and you are rocking them! Have a fun trip! Have a great trip! Love this cold shoulder sweater – beautiful color! Love this chic fall look! Those boots are amazing. Have fun in Vegas. It’s such a good time. My recommendation is hang out at a spa and a pool during the day. It’s so relaxing! Thanks for the link up.